On Jumping Off A Cliff With The Hopes That A Tiny Branch Might Save You [Pregnancy After Preemie]. My full term daughter was born on December 23, 2018 on a full moon. A cold moon. The cold full moon, and the first day of capricorn: the goat. She burst out with her robust cry weighing 8 pounds, and they put her on my chest so she could feel me and smell me. We laid there together for almost 30 minutes before I cut her umbilical cord. Her name is Greta. She is very strong. Her brother Elliott, a surviving twin who was born at 26 weeks, is now seven years old. The surreal nature of my daughter’s birth was stunning— I laid there with this gigantic sweet baby whom I could touch and who was in the same room with me, and I couldn’t believe the sheer grace of the entire thing. That I could protect her eyes from the lights with my hands, that she could sense me, that she wasn’t immediately swifted away in an avalanche of terror, that there was no loss. I couldn’t stop crying. All emotions came overwhelmingly to the surface, and as someone who’s been called “stoic”, it was like being in a whirlpool. Everything about her strength brought me back to the precariousness of her brothers’, William and Elliott’s, birth. From the minute of the positive pregnancy test my body awakened to the dread of what could happen-- what could finally come again— what would probably do me in for once and for all— the loss of another baby. And each moment of the pregnancy felt like a conscious decision that I could be putting another baby into a dangerous situation for the fact that they were living inside of my body. My body: the one that I still, deep down, blame/d for the death of my son William and for the prolonged hospitalization of Elliott. My angry and disorganized body. The body that could go haywire at 26 weeks and people could die from— that body. My friend Erika said she would make birth announcements that mentioned that nobody died; she got it. I just hoped I got that far. There was this other half of me that had always longed for more babies despite my massive fears. I found a doctor I trusted. We talked about the medical history. I pulled from my ancient knowledges to describe each medical intervention they used with my boys and tried to keep myself from describing my sons’ suffering as a result of the preterm labor. She said the Makena shot was a miracle. She said she’s seen a lot of success. 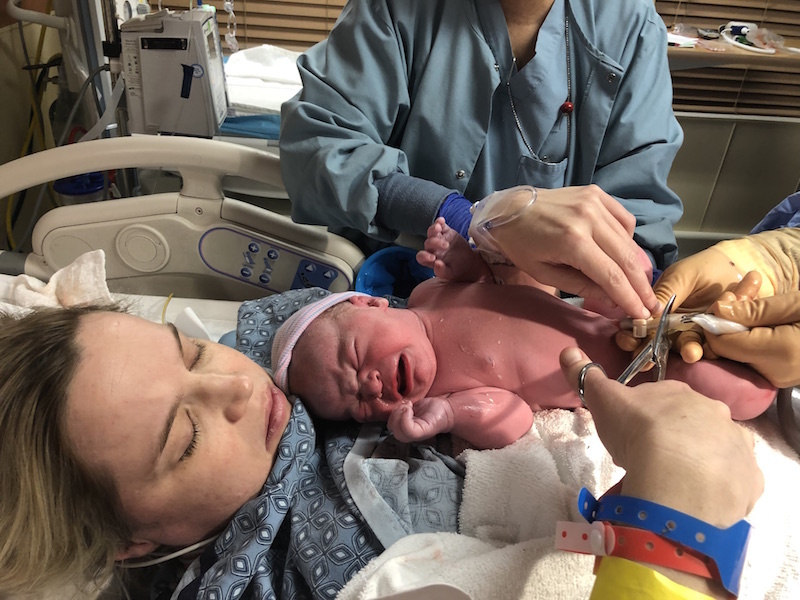 At 18 weeks, as we approached the danger zone, my high risk doctor joked that due to my advanced maternal age, previous preterm labor, and my (new and fun thing [kidding]) low-lying placenta, that we had our work cut out for us. I bit my lip trying not to worry, but spent the rest of the afternoon that day googling each condition, the likelihood of preterm labor associated with it, and crying. I realized throughout the pregnancy that there was power in my body’s memory, and that I had pushed that part out of me— out of my conscious thought. I realized that my body remembered everything despite my desperate and elaborate attempts to eradicate it over the course of 7 years. And with the help of my partner and my doula, I tried to walk through the steps of acceptance that this was not the same, that it would not be the same, even if the darkest of fears felt as if it was omnipresent. When the labor hit and it was real, the emotions rushed to the surface again, even despite my knowing we were in the “safe zone” of being past 37 weeks. And by some grace, I was lucky enough to be able to experience giving birth to a healthy daughter. Through the entire pregnancy and the birth, I was able to start forgiving myself (maybe for the first time) for the things that were not my fault, possibly for the fact that historically I had only experienced trauma associated with childbirth and motherhood. The night before she was born I saw two falling stars. There is something to be said for getting the chance to sleep in the same room with your baby the night they were born and to KNOW exactly what it feels like to not have that for 88 days, or ever. For being able to put her in a carseat and take her away from the hospital a couple of days after her birth, and remembering the carseat tests that kept your son from leaving for days. For feeling her suckle within the first hour of her birth—something I had never experienced. To put her in clothes you picked out (the nurses had dressed Elliott the first time, when I wasn’t there). To listen to her breathe unassisted, no wires or tubes: to hear her full cry even in those very first moments, a LOUD cry. Even in staying up all night with her for months on end— just you and your family— and no one to tell you some dire reason that she couldn’t sleep. For being able to make the first decisions for her, and not having to weigh what medical intervention would be the least likely to have long term consequences. Pregnancy after preemies, for me, was like being repatriated with the things I never thought I’d experience having, and to have every moment of it be a godsend, but a godsend of which I was hyperaware. I sometimes think that only the parents who’ve experienced trauma have this “gift”: the gift of being able to recognize and feel gratitude for the very precious thing you have in front of you, to have your hopes realized in the form of a baby, to not have the capability of taking the fragility of that for granted. To be reminded of the strength of your babies that were forced to fight. To realize the absolute gift that babies are. I am filled with a gratitude that is just as wordless and powerful as the grief (and gratitude) that came with loss almost 8 years ago, and once again, I am speechless.